*Last seen out under top-weight when a distant second, beaten 54 lengths, in G3 Betfred Grand National Trial Handicap Chase on heavy ground at Haydock Park on February 17. Has subsequently undergone wind surgery. 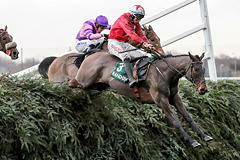 *Successful over the Grand National fences earlier this season, when staying on strongly for a nine-length victory over The Last Samuri in the Randox Health Becher Chase on December 9. *Performed pleasingly when the half-length runner-up to stable companion Bristol De Mai on his seasonal debut in the G2 Charlie Hall Chase at Wetherby on November 4. *Ran very well to finish fourth in the 2017 Randox Health Grand National on April 8, just under nine lengths behind winner One For Arthur. *Landed G1 RSA Insurance Novices' Chase at the 2016 Cheltenham Festival. *Only current trainer to win the Grand National more than once - thanks to Earth Summit (1998) & Bindaree (2002). Businessman Simon Such and his wife Sarah, in whose name their horses used to run, live in Worcester, while Gino Paletta (born July, 1959) is a businessman and British property investor based in Gresford near Wrexham, Wales. Paletta, married to Jeanette, was a director of Wrexham Football Club from 1990 to 1999. Racing interests: the pair have enjoyed considerable success with a small string, headed by Cheltenham Festival winners The New One and Blaklion. The New One, now 10, has won 20 of his 37 starts, earning over £1 million in prize money. Born: May 16, 1957 Background: Nigel Twiston-Davies initially combined training as a permit-holder with his farming interests from 1981, having his first winner with Last Of The Foxes at Hereford on February 3, 1982. The agricultural recession prompted him to make training his full-time profession and he took out a full training licence in 1989, recording his first win as a public trainer on December 30 of that year with Babil at Newbury. He has since gone on to register close to 2,000 successes, with his 1,000th winner coming at Stratford in October, 2006. Twiston-Davies rode 17 winners as an amateur under Rules and gained a further 17 point-to-point victories, and served as assistant trainer to Richard Head and Fred Rimell as well as having spells with Kim Bailey and David Nicholson. A childhood neighbour and friend of Peter Scudamore, he went into partnership with the champion Jump jockey to set up stables at Grange Hill Farm between Guiting Power and Naunton in Gloucestershire, although Scudamore has not been involved in the venture for many years (since 2003) and currently assists his partner Lucinda Russell, who won the 2017 Randox Health Grand National with One For Arthur. Since 2009, Twiston-Davies' business partner and assistant trainer is former stable jockey Carl Llewellyn, who enjoyed two Grand National winners thanks to Party Politics in 1992 and Earth Summit in 1998. Twiston-Davies adopted and developed the pioneering techniques of Martin Pipe, such as interval training and regular blood tests for his string, enabling him to rapidly raise his profile among the training ranks. He is the only current trainer to have won the Grand National at Aintree more than once, saddling Earth Summit to victory in 1998 and Bindaree four years later. Twiston-Davies has had 17 successes at the Cheltenham Festival, headed by Imperial Commander in the 2010 Timico Cheltenham Gold Cup. Other big-race wins include three Scottish Grand National successes, two Welsh Grand National triumphs and the Betfair Chase with Imperial Commander (2010) and Bristol De Mai (2017). At Aintree he has won the Betway Aintree Hurdle with The New One (2014), Khyber Kim (2010) and Mister Morose (2000), the Randox Health Topham Chase with Irish Raptor (2009) and Indian Tonic (1994) and the Randox Health Foxhunters' Chase with Bay Run (2011). His best season numerically was in 2010/11, when he enjoyed 97 winners, while he saddled 95 winners over jumps in 2016/17. He had two sons with his former wife Cathy . The eldest, Sam, 25, is stable jockey to leading Jump trainer Paul Nicholls and still rides regularly for his father. William (Willy), 23, a successful rider on the Flat and over jumps, announced earlier this season that he will not be returning to race riding. He wants to become a trainer eventually after working in bloodstock. The trainer is married to Vicky and they have four young children. Randox Health Grand National Record: 1994 Young Hustler (BD 11th); 1995 Young Hustler (UR 3rd), Dakyns Boy (UR 10th), Camelot Knight (FELL 21st); 1996 Young Hustler (5th), Captain Dibble (11th); 1997 Camelot Knight (3rd), Dakyns Boy (8th), Grange Brake (Refused 27th); 1998 EARTH SUMMIT (WON); 1999 Earth Summit (8th), Camelot Knight (BD 22nd); 2000 Camelot Knight (15th); 2001 Spanish Main (FELL 1st), Beau (UR 20th); 2002 BINDAREE (WON), Frantic Tan (UR 5th), Beau (UR 14th); 2003 Bindaree (6th); 2004 Shardam (UR 3rd), Bindaree (UR 6th); 2005 Bindaree (11th), 2006 Baron Windrush (UR 3rd); 2007 Knowhere (UR 8th); Naunton Brook (PU 23rd), 2008 Fundamentalist (FELL 3rd), Ardaghey (FELL 4th), Naunton Brook (PU 19th), Knowhere (UR 25th); 2009 Battlecry (16th), Ollie Magern (FELL 2nd), Fundamentalist (PU 21st), Knowhere (PU 25th); 2010 Hello Bud (5th), Irish Raptor (FELL 10th), Beat The Boys (PU 19th), Ballyfitz (FELL 22nd), Ollie Magern (PU 28th); 2011 Grand Slam Hero (FELL 13th), Hello Bud (PU 29th); 2012 Hello Bud (7th), Viking Blond (FELL 1st); 2013 Major Malarkey (11th), Viking Blond (PU 15th), Imperial Commander (PU 22nd); 2016 Double Ross (PU 26th); 2017 Blaklion (4th).